Now with Setup Squeezer for Windows Installer and Setup Squeezer for InstallShield, you can take advantage of InstallAware’s industry-leading package compression — without having to migrate your setup projects. Simplicity — a very simple wizard interface helps you intelligently unpack and repackage existing setups. Cross-Platform Support — the Setup Squeezer runtime supports all modern versions of Windows from Windows 95 to Windows Vista. Greater User Control — Unlike with other tools, users can click cancel to abort the extraction process. Very Small Footprint — The extraction can be performed with as little as 32MB of physical memory. Nested Installation Support — Nested installation packages are recursively scanned, opened, and automatically recompressed. Advanced Package Compression — Setup Squeezer performs up to 5x better than ZIP, CAB, RAR, or SITX formats. Improved User Experience — Setup Squeezer improves download performance and reduces user frustration with rapid unpacking. Rapid Compression — Realize significant time savings when running Setup Squeezer on dual-core and hyper-threaded machines. Setup Squeezer's data crunching algorithm ensures that setups are as small as possible. The advanced LZMA encoder used in InstallAware uses technologically superior methods of eliminating redundancies across multiple files. Setup Squeezer provides BCJ2 filters that pre-process your executables and increase their compressibility. Windows Installer: For squeezing Windows Installer setups. 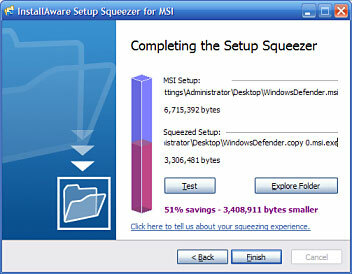 Click here to download Setup Squeezer for Windows Installer. InstallShield: For squeezing InstallShield setups. Click here to download Setup Squeezer for InstallShield. Click the links below to order now.